C’mon let’s face it. This film has already been nominated with all sorts of Oscars, even 3 months before the ceremony (and it’s going to win quite a few as well, including the best film). It’s one of those crowd pleaser that somehow manages to score really high, despite the fact that’s it’s actually a fairly average film. 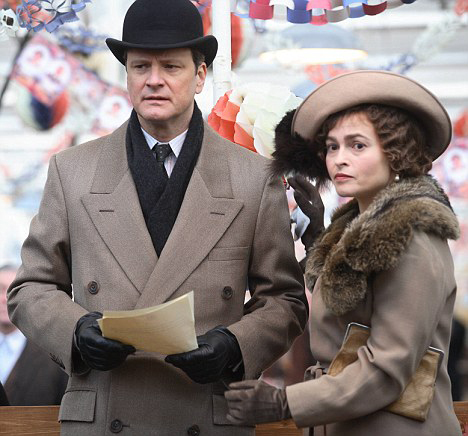 What elevates “The King’s Speech” is its cast, there’s no doubt about that. Colin Firth will be laughing all the way to the Oscars and most likely will win what he actually deserved in 2009 for A Single Man, and Geoffrey Rush, will somehow manage once again to get his name up there with the other nominees at least. In fact, each scene with the two actors together is worth the price of your tickets, even if you have to sit the rest of the movie which , to be honest has some pretty clunky bits. On the whole it feels a little bit like the “TV movie of the week” or a theatre play, in the same way “The Queen” did a few years ago (a film which I loved by the way and which I still think was highly superior, much more clever, wittier and a lot more subtle that this). The fact that it looks like a play is by no means a criticism. Some of my favorite movies (One flew over the cuckoo’s nest, rear window just to mention a few) are very much confined films which could very well be made on a stage (in fact most of them have). Unfortunately this film, in my view, doesn’t really have a good director at its helm like “the Queen” had. In fact it seems like every single decision Tom Hooper has made is wrong: the cartoony staging of certain scenes for example (the one where the wife sits on the king diaphram as he practices his speeches is really idiotic for example). The choices of camera angles or camera movements are just too showy and they only seem to enhance the silly side of the film: those tracking shots forward and backward within the same room used as time-lapse are really very artificial and they actually draw attention on themselves instead of serving the film and its story. And those shots of the king being framed in a corner or the screen are anything but subtle. Clearly “Subtle” is not a word that’s in mr Hooper’s dictionary: every single time the King is about to give an important speech, on cue, the music starts, just to warn the audience “Oh watch out… this is going to be emotional”… Well, it seems to work. Audiences all over the world are loving this film. “The King’s Speech” is clearly aimed at an American audience, possibly even more that the Queen was. Every historical information is spoon-fed to the audience in a pretty clichés way to the point of becoming a little bit annoying and taking you away from the real good part of the story which is the relationship between Firth and Rush. Thankfully their performances are so much fun, that they manage to elevate the film and making it OK, despite of everything else. Best film of the year? Well, it has costumes, good performances, big names, it mixes drama with comedy, somebody with a disability… It must be then. I’m afraid not. It’s just an average film, well made and well acted and looking for attention. Sadly it might get it. I probably enjoyed it more than “Black Swan” too, after all it’s undoubtedly a more much crowd-pleaser film, certainly a “lighter” and “easier” one too, but as I said I think most of it has to do with the story itself and the scenes with Colin and Geoffrey more than that actual film-making itself, which to me was a lot more accomplished in “Black Swan”. However they are two completely different films and really I should not even compare them to each other. The fact that I gave a slightly higher rating to “Black Swan” is irrelevant. Each film should be judged within its own genre. For an Historical drama/comedy “THe King’s Speech” was pretty low-key, in my view. Unremarkable from a directorial point of view and a bit of a mess when you look at everything else around the great scenes with the king and his speech therapist. The stuff with Churchill is ludicrous, and so is the caricatural aspect of the film that aims towards the cheap and easy laughters undermining what could have been a much deeper film. Still a good film a way above the average (I agree, probably my vote should have been 7 and not 6.5). Black Swan, as a psychological/horror film is something almost unique, if anything just for the ballet environment. It is a flawed film, however it’s handsomely done and it does create an erie atmosphere that is so tense that it becomes almost unbearable. Natalie Portman gives a great and powerful performance and, dare-I-say, a more complex one than a stammering king (I do love Colin, don’t take me wrong). But again, 2 different films… which by the way, they’ll both win at the Oscars.